"Bulb" comes from a bulb of a plant and "saur" meaning "lizard". "Lizard with a bulb"
It can go for days without a single morsel. In the bulb on its back, it stores energy. This pokémon has less weaknesses in GSC than RBY, and in RBY it has a 4x weakness to BUG. Better defense ratio in GSC. Razor Wind Teach RBY TM02 (Razor Wind) to RBY Butterfree or Venomoth, then transfer to GSC. If male, breed with a female from the Paras Family. 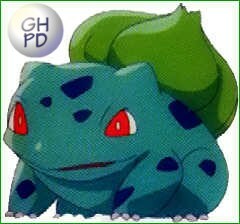 Then breed male offspring with Razor Wind to female from the Bulbasaur Family. Safeguard Mate with a male from the Chikorita Family. Light Screen Mate with a male from the Chikorita Family or Mareep Family. Skull Bash Mate with a male from the Squirtle Family. © 2000-2017 Pokémon Dungeon. This site is owned and updated by, Luke Hackett aka DarkReignn. © 2017 Pokémon. © 1995-2017 Nintendo/Creatures, Inc/Game Freak, Inc. ® and ™ All rights reserved. Pokémon Dungeon is not sponsored or endorsed by, or otherwise affiliated with Nintendo or its licenses. Credit is also given to Curtis Alumbaugh aka Gengar for creating the site and pokédex, and Ian Alumbaugh aka Haunter for the idea of beginning and for help promoting this site in its earlier years. Click here for the Staff & Credits Page.